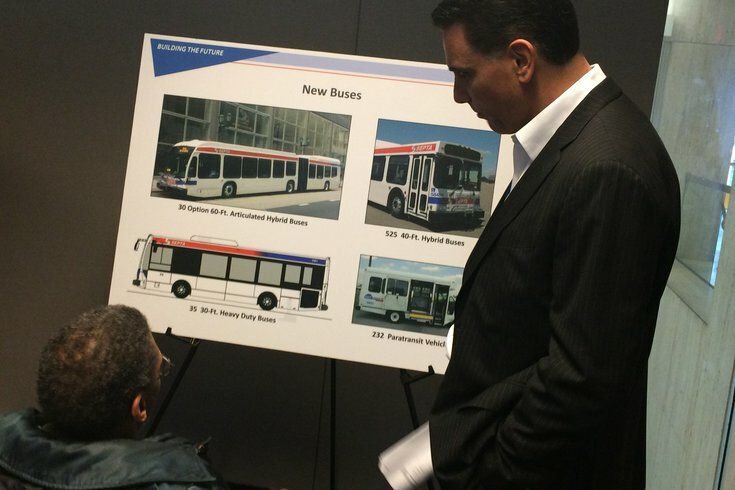 Jerry Guaracino, project manager for the acquisition of new SEPTA busses, talks to Thaddeus Robinson, of West Philly about the handicapped accessibility of the new busses that SEPTA plans to add to its fleet. SEPTA officials opened their doors to the public on Wednesday to preview a litany of upcoming projects, ongoing plans and incoming investments that include dozens of double-decker regional rail trains, scores of new buses, updates to concourses and stations, and installation of speed-control technology. "This is our state of the budget," Catherine Popp-McDonough, the agency's capital budget director, said at SEPTA headquarters on Market Street. "We are here to ask, 'What are we really going to spend?'" The "Rebuilding for the Future" capital expenditure program outlined by the agency will be carried out through 2020. For the 2017 fiscal year, SEPTA has a total capital budget of $539.2 million, including $228 million in federal money and state funding of $326.8 million. By 2020, federal funding will grow to $241.4 million and state moneies will increase to $355.2 million. Popp-McDonough said the new funding levels that SEPTA will see over the next five years are courtesy of the recent federal FAST (Fixing America's Surface Transportation) Act. She addressed how the transit agency plans to spend additional funds. While only estimates now, Popp-McDonough presented budget figures to show how SEPTA plans to afford the many projects already underway or in the pipeline. These numbers will be finalized by April. The planned improvements include a new way to pay to ride – the SEPTA Key system - as well as updates to Center City concourses, regional rail stations and the City Hall station. Not to mention the 30 new 60-foot buses, 35 new 30-foot buses, 525 new 40-foot hybrid buses and more than 230 new paratransit vehicles that will join the existing fleet of about 1,600 vehicles. Along with the new vehicles, which Popp-McDonough said are needed because "we need to have a constant replacement system for our buses," SEPTA also hopes to secure a grant to afford at least 25 new electric buses that can be used for shorter routes throughout Center City. 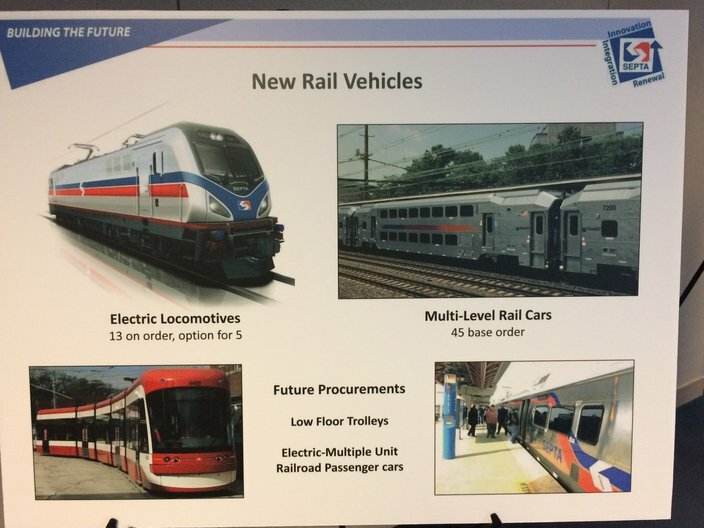 A quick look at some of the new trains that SEPTA plans to add to its fleet in the next five years. SEPTA also will be installing a Positive Train Control system on regional rail lines. Already "95 percent" installed, the new technology could be operational by late February, according to Michael Monastero, project manager for the PTC program. The system, which helps control the speed on trains, could have prevented the May 12 Amtrak crash that killed eight people, officials have said. The PTC technology is able to shut down trains automatically in case drivers are operating them at an unsafe speed. It will enhance safety by giving systems operators the ability to slow trains where workers are on a track, or for other obstructions, even if the train's driver isn't aware, Monastero said. And it will provide much-improved real-time information about the locations of trains on their routes to better inform riders of accurate arrival times. "If [train operators] don't follow that curve within three miles an hour (of the posted speed) it will just drop you," Monastero said. "This will run us much more effectively on curves." One of the most anticipated changes for riders is the new SEPTA Key program, which will allow riders to use a debit-style card for fares for all forms of transit in the city. Kevin O'Brien, project manager for the Key program, said the system is expected to go live in the spring. "This will be the same as a token to transfer, but, it will be all in one place," O'Brien said. "It will be just like E-ZPass." Eventually, O'Brien said, the card will allow riders to add money to their accounts and use the Key card they would a like a gift card at a store. He said the ability to use the SEPTA Key card as something of an debit or credit card would provide a banking option for many riders. "It can serve as a bank account if you don't have a bank account," he said. Regular riders, who were in attendance on Wednesday, said the long-reaching plans and improvements are welcome. Most especially, accessibility is important, said Thaddeus Robinson of West Philadelphia, who uses a wheelchair. "I like it and it (accessibility) has been much better," he said. Denice Brown of North Philadelphia who is blind, agreed. "We are very, very interested in SEPTA accessibility," she said. "I rely on SEPTA just about every day, and I'm looking forward to all disabled people, like me, being able to use all types of public transportation."